The unraveling of the Syrian regime is moving pieces on multiple geopolitical chessboards. Iran, Russia and China are the losers should Syria fall. 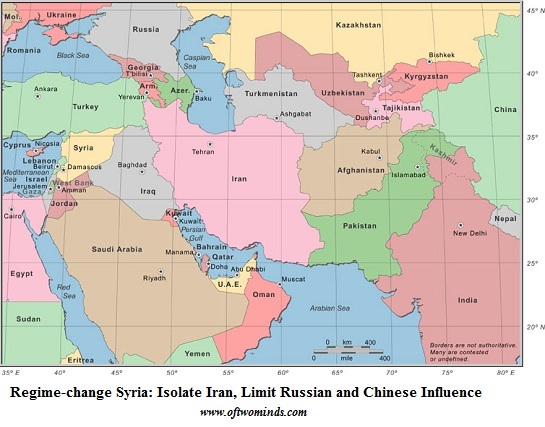 Geopolitics is called "The Great Game," as major powers attempt to influence or control lesser players in pursuit of a Grand Strategy of dominance and security.The Game appears to be afoot in Syria, and multiple players and strategies are at work. 1. The average American knows very little about how the Empire or U.S. Armed Forces work. Many insist there is no U.S. Global Empire because it doesn't fit their idealized conception of America. Others overstate its dark nature. It's just business, folks; other powers are playing the same game, ruthlessly advancing their own interests. Power vacuums will get filled by somebody. The U.S. Empire is vast and mostly hidden from view. Those of us outside have to read between the lines of what we read in policy journals and the trickle of "news" that filters in through the perception-management and propaganda. 2. Though Americans and foreign powers alike tend to see the Empire in simplistic terms, the American Empire is rife with conflicting policies and fiefdoms. Great Game strategy is rarely amenable to reduction: there are too many factions and internecine conflicts bubbling away for there to be complete unity at the top. One side may win the policy battle, but the defeated factions (those who don't quit or move to plush positions in academia) may "leak" their view or present it (in an acceptably watered-down format) in policy journals. 3. No one has god-like powers in the Great Game. Blunders are made by all the players as they miscalculate others' intentions and ignore substantive intelligence and cultural analysis in favor of wishful thinking and misleading ideology. 4. Many observers, both domestic and international, base their perception of the U.S. Empire on simplistic assumptions. Civilian and military leaders of all nations take pains to publicly present their strategies in domestically acceptable terms: American leaders talk about "bringing democracy to oppressed people" while Chinese leaders talk up their bellicose defense of Chinese territorial interests. These pronouncements are of course public relations, but they do reflect the cultural mindset and assumptions of each power's leadership. For example, China's public foreign policy is a bipolar mix of "we are a peaceful nation seeking security" and "those are our islands, don't mess with us." China's Asian neighbors wisely focus on the second half of the message: beneath the PR, China is seeking dominance (hegemony) in Asia and the world. Nonetheless, the Chinese believe the first half of the message, and this self-definition cannot be dismissed as mere PR. What is often lost about U.S. Imperial policy is that it isn't always as simplistic and blundering as assumed, nor is always the lead force; sometimes it's reactive. 5. The U.S., China, the E.U. and Russia are not the only players. The regional powers often control the action, and the "great powers" are left jockeying for whatever influence is up for grabs. we can discern in the silences (i.e. that which is unsaid and unreported) a Great Game move underway in Syria. There are many layers to the game, but it seems the core strategy is to neutralize Iran not by frontal attack but by isolating it. The uprising in Syria has opened an enormous opportunity for Iran's enemies to peel off its most critical regional ally. In some ways, Syria was akin to a vassal state of the Iranian suzerainty; it was a path for Iranian weaponry to flow to Lebanon and an anti-American, anti-Israeli, anti-Saudi and anti-Turkish stronghold. A quick look at a map reveals that Iran will be short of regional allies once Syria slips from its sphere of influence. Iran will lose its easy access to Lebanon, and find itself surrounded by nations hostile to its own aspirations for hegemony. Removing Syria from the sphere of Shi'ite Iran is the strategic goal of Sunni Saudi Arabia and its allies. There is also no love lost between Turkey, a rising regional power with a long and glorious Imperial history, and the embattled leadership of Syria. Factions in Iraq also see opportunity to consolidate their influence as the Syrian dictatorship unravels. I suspect that the U.S. is providing logistical and tactical intelligence support to those aiding the rebel forces, but avoiding any public role that would be counterproductive to the larger strategy of isolating Iran. This sets up the last piece in the end-game strategy: allowing oil prices to decline to the point that Iran can no longer fund its welfare state and military/police machine with oil profits. I have posited this before and been told this is "impossible," as oil prices can't drop that low ever again. Perhaps. Perhaps not. But it can't be lost on the players that the regimes in Iran and Venezuela are almost totally dependent on oil export revenues for their power and legitimacy. Oil dropping back to $35/barrel for any length of time would bankrupt all exporters without other income streams. This is the direct result of the "oil curse," i.e. the dependence on oil for revenues. If oil falls dramatically, the main driver will be a collapse in demand due to global recession. That decline in demand is probably already locked in, regardless of what happens in the Great Game. The elimination of the Syrian leadership will be a major blow to Russia and China. Russia has been Syria's Great Power protector and weapons supplier for decades, and China has been working the age-old "an enemy of my enemy is my friend" strategy of cozying up to Syria and Iran to offset U.S. power and secure oil supplies that are outside of U.S. influence. All of this helps explain U.S. reluctance to attack Iran. Why take on the risks of military action when isolation and a collapse in oil prices are on the way? Sometimes the "winning strategy" is to step aside and let internal contradictions play out rather than over-reach or over-react. Sometimes there is no need to "win" a war or even control territory; it is enough to deny control to other Great Powers. Thank you, Dennis G.($50), for your monumentally generous contribution to this site-- I am greatly honored by your ongoing support and readership.